Summer may be gone but someone needs to tell the local weatherman to change the humidity dial. Still a bit muggy in north Florida. I am thinking something that smells like baked pumpkin now! Is your mouth beginning to water too? I took a last trip through the park at Huguenot to see how the young pelicans were doing. What surprised me was that I saw about 50 fully feathered young Pelicans and only one or two adults. All the rest of the adults were either somewhere out fishing or taking a much-needed break from the dune rookery duties. Nearly all the young fledglings had their back to the sun and were panting through their beaks to keep cool. There was very little movement on this hot muggy day. It seems it was a very successful nesting season on the dunes. They will be flying away any day now and learning to fish with the adults. A pair of Willets were moving slowly along the receding surf line gathering tidbits to eat. I sat down in the sand ahead of them and although they gave me a glance, they just continued to forage in my direction and scampered by my feet. I captured some nice full frame shots as they went by. Willets are a large species of sandpiper common to these southeastern shores. Per the Cornell Laboratory of Ornithology; “Two distinct subspecies occur in North America: one that breeds in the East and another that breeds in the West. (Both subspecies may be seen along the East Coast during fall migration. Eastern Willets leave the U.S. in winter for Central and South America, while some Western Willets winter along the East Coast.) 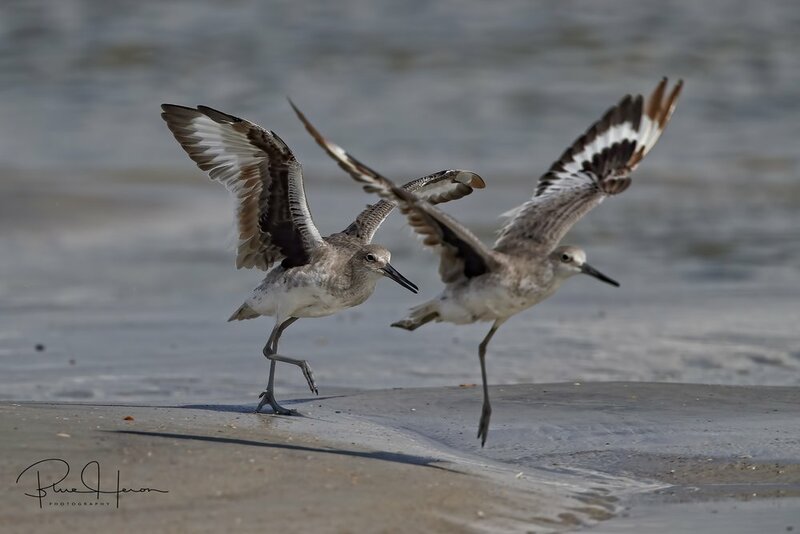 Willets are gray or brown birds that, when flying, display a striking white and black stripe along each wing. In summer, Willets are mottled gray, brown, and black; in winter they are a more consistent plain gray. The legs are bluish gray." Several Osprey were also circling overhead, plunging into the surf after a fish, and taking their prize back to a nearby tree to eat. As I left the park a Great Egret was keeping close tabs on the local fishermen, hoping for some leftovers to eat. I think I will start bugging the Editor about some pumpkin muffins or maybe even a pie. How does that sound for a good start to the fall season? For everything there is a season and for this one in particular it’s pumpkin! Blessings. 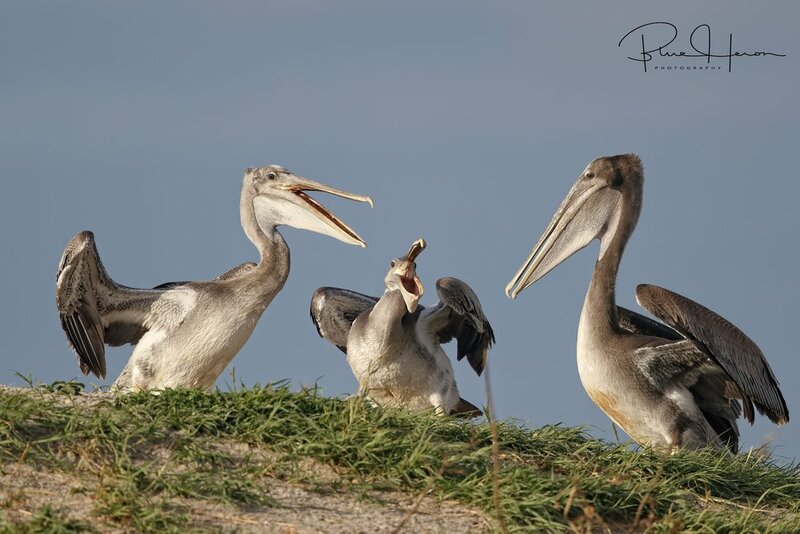 These young fledgling Brown Pelicans are ready to fly but can't stand the heat. There were only one or two adults with the young Pelicans..
A pair of Willets came waltzing towards me with their distinctive wing stripes showing. They were so intent on feeding they walked right by my feet giving me some full frame captures. Shades of browns and grey mark this large sanderling species. Several Osprey were busy fishing also..guess who is coming for dinner? I think I smell some pumpkin muffins cooking....gotta go for now! Did you ever try to learn a new skill or expand your horizons? One of my photographic goals this year is to get out of my “bird comfort zone” and learn to photograph landscapes, sunrises, sunsets and learn some new camera techniques. There is a real active group of photographers that I shoot with called Photo Walk Amelia. Lead by Scott and Dawna Moore, they get folks together to shoot many of the local sites at sunrise, moonrise, moonset and other events around Amelia Island and just plain have fun with other photographers. It is amazing what you can learn by just watching someone else and asking questions. Per Wikipedia…”Uniola Paniculata, more commonly known as sea oats or seaside oats is a tall subtropical grass that is an important component of coastal sand dune and beach plant communities in southeastern United States, eastern Mexico and some Caribbean islands. Its large seed heads turn golden brown in late summer give the plant its common name. Its tall leaves trap wind-blown sand and promote sand dune growth, while its deep roots and extensive rhizomes act to stabilize them, so the plant helps protect beaches and property from damage due to high winds, storm surges and tides. It also provides food and habitat for birds, small animals and insects.” I tried my wide angle lens at 10-22mm and captured the Sea Oat Sunrise. I used an in camera HDR (High Dynamic Range) technique to try an capture the range of colors as the sun rose through the clouds. I hope you enjoy them. Try getting out of your comfort zone this week and attempt something new, improve a skill or learn a new one. You are never to old to learn. Blessings. 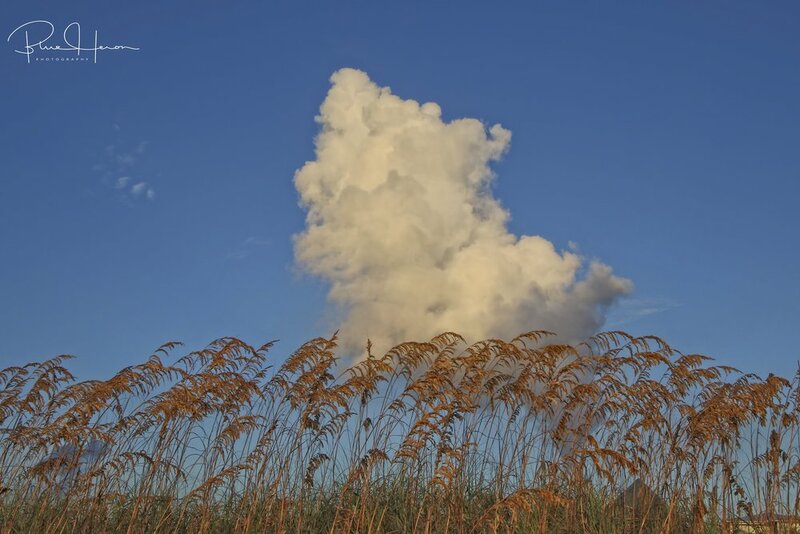 Sea Oats, a tall subtropical grass is an integral and important part of a healthy coastal dune environment. Sea Oat Sunrise captured at 10 mm, a bit wider view using in camera HDR..which do you prefer? The Sea Oat heads are turning golden brown..soon they will be gone till spring..
Had to get some birds in there somewhere...Pelicans flying down the beach..
Brown Pelican soaring over the sea oat covered dunes..
Beauty is in the eye of the beholder it is often said. September is finally here, and do I have a beauty to share with you today. I wish I could say the weather is beautiful, but it is still a bit muggy here in the deep south. Hopefully the humidity will clear out soon when the fall frontal systems bring some cool refreshing air over the region. Good bye Bermuda High! Hope the hurricane spares the east coast. Sitting on the dock, looking beautiful as ever was one of our local Wood Storks. Per the Cornell Laboratory of Ornithology: “Large, white Wood Storks wade through southeastern swamps and wetlands. Although this stork doesn't bring babies, it is a good flier, soaring on thermals with neck and legs outstretched. This bald-headed wading bird stands just over 3 feet tall, towering above almost all other wetland birds.” They are mostly seen in the southeast in the states of Florida, Georgia and South Carolina. Some other facts. To keep the nestlings cool, the parents will regurgitate water over them. Sounds like fun at the water park? The association of storks and babies was made popular by Hans Christian Anderson’s fable “The Storks” written about the beautiful European White Stork. My fable is the ugly stork has to deliver the ugly babies. The oldest Wood Stork recorded was a bit over 20 years old. Bacteria in the mud destroy this bird's head feathers when it feeds giving it a unique look to say the least. While my still shots reveal a dire need for the latest miracle anti-wrinkle cream, these storks are masters of flight and I love to watch them soar by. You can’t tell a book about its cover. You have to read it. You can’t assume this is an ugly bird by its appearance either. It is unique and a beauty to see. Hope you enjoy! Blessings. You must not love me for my looks alone...after all beauty is only feather deep! Got to keep my feathers looking fine! Do you think that new wrinkle cream will reduce the bags under my eyes and on my forehead ? Sorry, lost my head there for a moment! Off to the beauty parlor and then to Janet's to get my hair feathers done! The morning sun breaks over the ocean like a huge orange ball sending shimmers of fiery light across the waves. No-one else is on the beach but the Pelicans, a few remaining Royal Terns, a Snowy Egret and a lone Sanderling. The summer nesting season is all but over for the terns and gulls. The tide is receding, and the high-water line mark is littered with bones and feathers of the hapless young birds who were victims of predation. But the lucky ones have survived. As I make my way to the dunes where the Brown Pelican colony remains, a long procession of pelicans takes wing and glides by heading for the surf. There are still hungry beaks to be fed. The chicks are nearly all fully feathered now and ready to fly. Unlike the previous visit where they were sitting in the summer heat rather hapless and still, now there is motion everywhere. The chicks are hopping up and down, skipping down the dunes, jumping, stretching their wings and flapping them in constant motion. They seem to be dancing in the dunes. I spot a group of three chicks discussing flight preparations. Bradford the chick says he is ready to fly. His two feathered companions seem to laugh at him and dare him to try. Bradford just lifts his wings, rises off the dune, flaps his wings, and lands about 10 feet away. His two companions are amazed. Bradford flew for the first time, just like Orville and Wilber Wright! Now look who is dancing! It won’t be long before they are all taking flights to the surf zone now. Almost makes me feel like dancing too, except I can’t fly, yet that is. Hope you had a nice Labor Day weekend and took a rest from your labors too! Blessings. An adult Brown Pelican makes its final turn into he colony to feed the chicks. A "snowy flurry" in the surf..
Full flaps applied for landing.. Here comes Bradford, he thinks he can fly! Ha Ha Ha...you can't fly yet dummy! You just watch me then! Here I go..
Touchdown, Bradford flew like Orville and Wibur Wright! He did it! Bradford's friends were dancing in the dunes!